Throughout October I’m going to be taking some time off and have invited a handful of my favorite bloggers to join us. Today the rockin’ Erika of Delphine is back and I’m so excited. Be sure to check out Erika’s design work and her blog! Hi again! 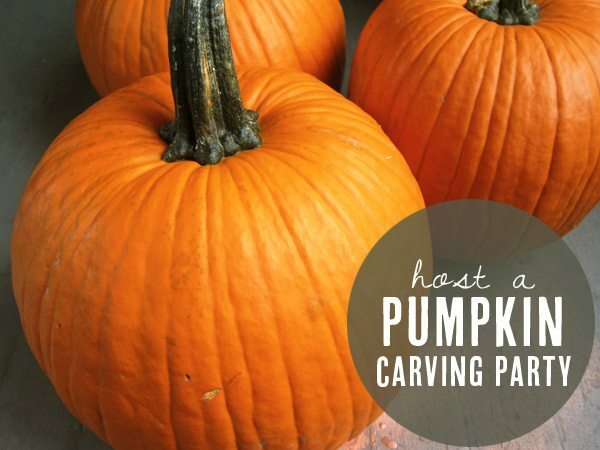 It’s Erika here from Delphine, and I’m so happy to share a fun, fall neighborhood party idea with you. Pumpkin carving can be an icky, messy chore. But do a little prep work, gather all the neighbors in your back yard, throw in some warm apple cider (with a little rum spike for the grown ups), a platter of bread and cheese, some cookies for the kids, and carving becomes a great excuse for a neighborhood get together. It’s a pretty easy party to throw together. The main thing is to have a lot of tools to make the carving go smoothly. Ask your guests to provide their own pumpkins (but have a few spares in case someone forgets or has an accident). I like to use plastic/disposable table cloths or butcher paper to cover long folding tables, that way when the party is over I can just throw them away. Put carving tools and spoons in empty cans, provide some spooky templates (you can get a book of them at the grocery store for about $5), and put a roll of paper towels on each table for messy hands. You’ll also need tape (for the templates) and sharpies for those who want to draw their own templates. Make sure there are adults around to help with the carving bit. If there are a bunch of little ones, it’s a good idea to set up a separate table with paint, glue and embellishments for them to use. I like to gather acorns and leaves from the yard to stick on the pumpkins. 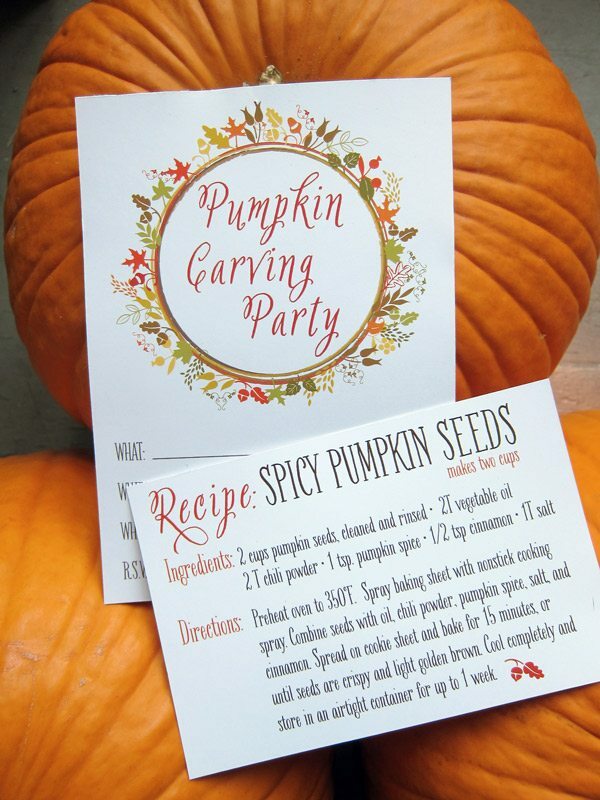 This type of party doesn’t really need much decorating…maybe a few mini pumpkins on the tables, and a pumpkin spice candle or two, but the messy activity of carving is the main attraction here. 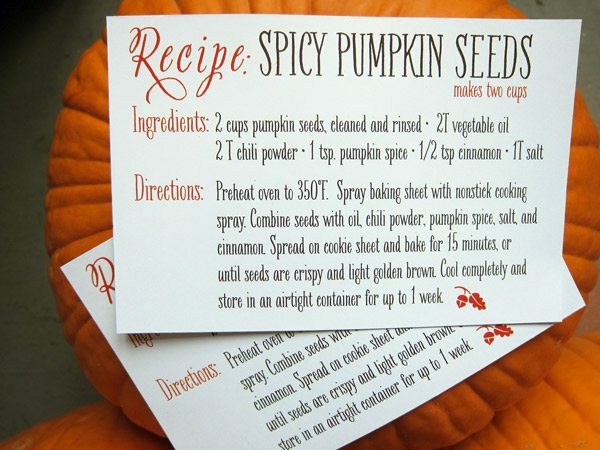 Give everyone a baggie so they can save their pumpkin seeds and send them home with a recipe for making spicy roasted pumpkin seeds. On Halloween night everyone will have fun walking around the neighborhood to see all the masterpieces! Ready to get the party started? 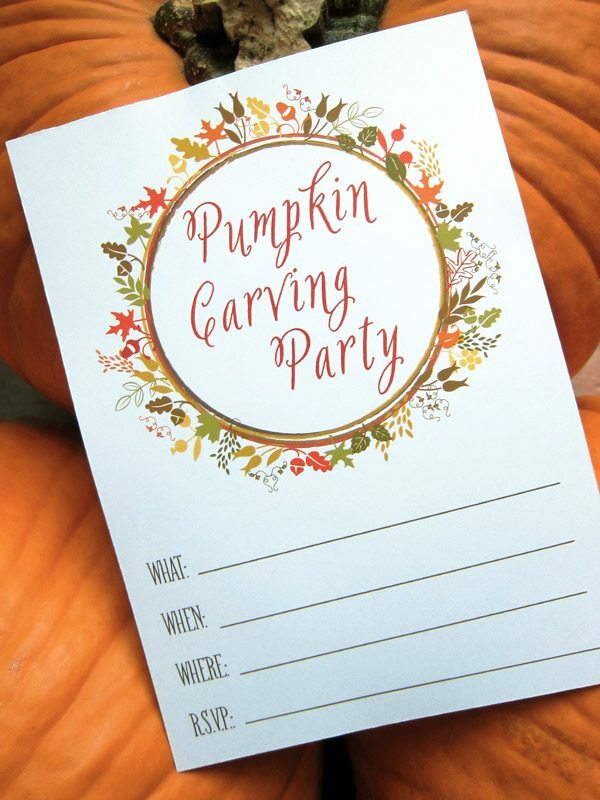 Download your pumpkin carving party printables, invite the neighbors and get your Jack O’ Lantern on! 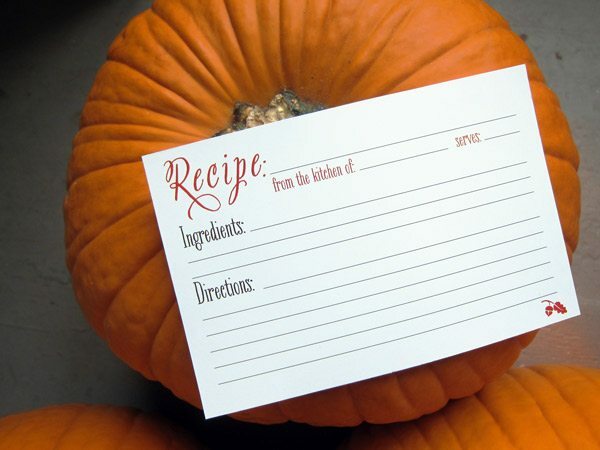 The suite includes party invitations, a recipe for spicy pumpkin seeds, and blank recipe cards for sharing your favorite fall recipes with friends. Happy carving!